Often there’s no faster route to total satisfaction than a sudden surge of spontaneity and set out in search of a carnivore’s feast. To satisfy this urge and raise our weather dampened souls last week, we headed down to The Chophouse on Shelbourne road. The Chophouse Gastro Bar is a relaxed eatery offering a dining concept within a pub style setting. Chef/owner Kevin Arundel is committed to using the finest Irish produce to create dishes that are fresh and in season but as the name suggest, the speciality here is quality Irish meats, which are sourced from farms in Co. Roscommon and Louth. 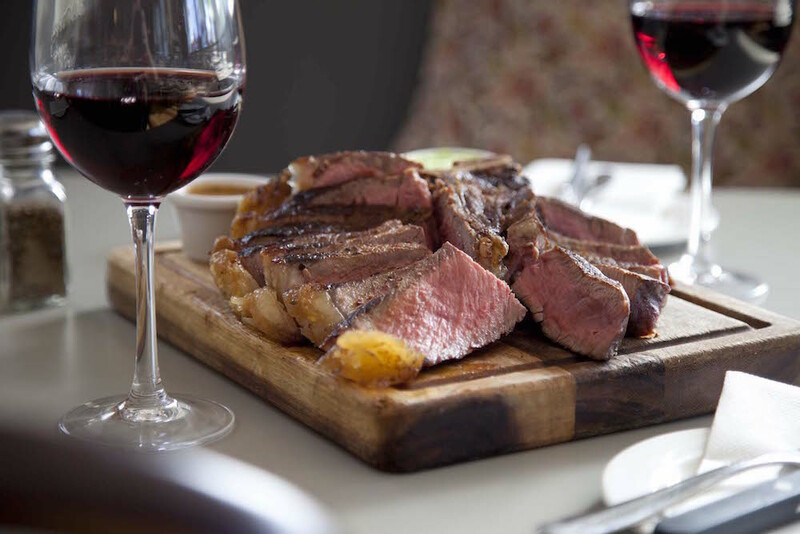 From Dexter, Hereford, Limousin & Porterhouse to mention a few, along with lamb and pork choices,the menu caters for all tastes and includes a good selection of fish dishes as well, which are updated every morning on their blackboards scattered across the restaurant. We were seated at a corner table by large Windows painted in Elephant grey, filling the spacious room with glorious light. It felt very welcoming and unpretentious. An interesting menu, all very reasonably priced, included Starters of 5 Miletown goats cheese, Aubergine caviar, Salted Hazelnut, Tomato& red pepper dressing @ €9.00 or how about a Ballotine of smoked Ham hock & Foie Gras @ €11.50, with Spiced apple & Pear, Fennel salad or an inviting Ravioli Ricotta & Wild Mushrooms @ €9.50 with Walnut, baby spinach & porcinni sauce. My starter of Caramelised Scallops, Double Alsace bacon & sweet celeriac puree @ €14.00 exceeded my expectation. Moist & silky, it melted in the mouth with just a hint of smokiness from the crispy bacon and complimented by the smooth and velvety sauce to make it a perfect mouthful. 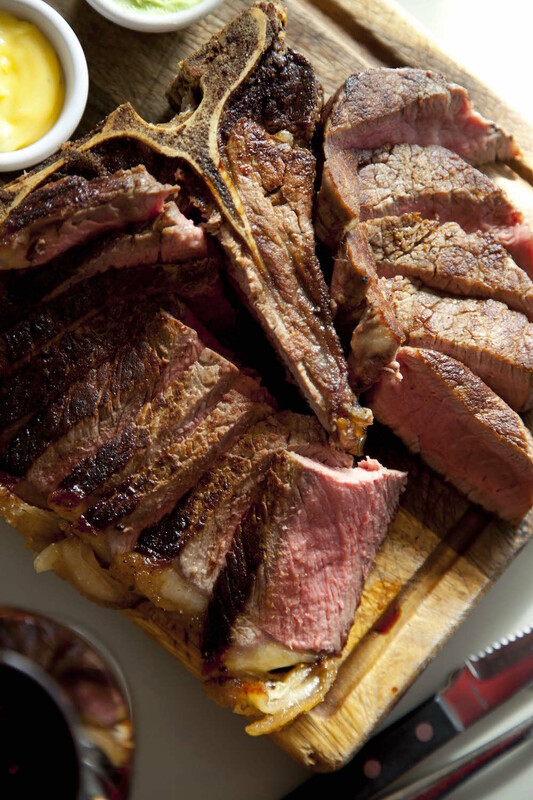 Moving onto mains courses, are familiar fares of 35 day dry aged Limousin or Hereford Beef, 10oz Rib eye steak @ €28.00,includes sides of garlic green beans,caramelised onion & twice cooked chips and a choice of cracked black peppercorn, Bearnaise or garlic butter, or Roast lion of Wild Wicklow Venison, buttered Kale, celeriac puree, Jackmac’s black pudding & Veal jus cream @ €28.00, or simply Roast breast of free range chicken, Wild mushroom & scallion creamy, pomme puree & cep cream @€19.00. Must be the best chicken in town, it brought back memories of Chicken cooked in my mother’s kitchen and of her mother’s before that. On this occasion, I opted for the Chump of Slane Valley lamb, organic carrot puree, savoy cabbage, fondant potato & port jus @ €27.00. It was delicious. The lamb was tender and fell apart at the touch of one’s fork, it sat atop delicately sauteed savoy cabbage. And the fondant potato was pure indulgence, the accompanying sauce helped to balance out this perfect dish, ideal for this wintry evening or a Sunday lunch. It fulfilled all requirements. The Grilled Fillet of Irish Hereford Beef, with gratin potato, horseradish & parmesan crust, spinach & garlic cream @ €32.00 was equally delicious, full of flavour and beautifully cooked to medium rare as requested. The potato gratin was creamy while the sautee spinach added a smack of freshness to this perfect feast. For Desserts, on the recommendation of very pleasant waitress Cathy, I chose the Bailey’s & Mascarpone mousse with berry compote and granola. The mousse was smooth and wonderfully light and ever so lightly flavoured with the liqueur that it didn’t overpower while the granola added a welcoming touch of textures Perfect and was an ideal choice to compliment our meal and as the evening ebbed away, we thought, .. Yes, this is exactly what was needed and how a cold wintry evening should be spent. The Chophouse is very popular with locals as well as with business people from the surrounding areas but I also see group of friends and couples who want some tasty food before hitting the Aviva Stadium for a Concert or en route to Sandymount beach or the RDS in Ballsbridge. We loved the emphasis on local produce, friendly, attentive staff and the relaxed vibe of the place. Well worth a visit and excellent value for great food.